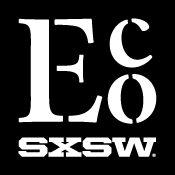 I just returned from the SXSW Eco 2016 conference in Austin, TX last week and it was another awesome experience. This is my 6th conference since its inception. As always there were many fabulous keynote speakers, including the great Robert F. Kennedy Jr., Kate Brandt, William McDonough, Dr. Sarah Richardson, Michael Ford and Bryan Lee Jr. and the great Bill Nye "the science guy". Professionals were speaking about everything from nuclear sharks, climate crisis, sustainable designs, environmental justice, reducing plastics, carbon neutrality, zero food loss, hip hop design justice, hemp farmers, organic farming, water conservation, renewable energy and driverless cars. There were workshops, labs, panels, themed lunch groups, field trips, films and start up competitions on such a wide range of topics it would be impossible to try and share everything that went on in the three day conference. I'm always amazed at the amount of knowledge and talent at this event and it gives me great hope for our future with the smart, creative people designing the tools and technology needed to save planet earth. I always learn so much and get to meet some awesome people in the process. No SXSW Eco conference would be complete without mentioning the cool after party's put on this year by Pepsico and Geostellar or the closing Eco Awards party. These events are always a lot of fun and offer great networking opportunities for everyone.